Germany's highest court has said it will announce on Thursday if an early general election slated for September can go ahead. German Chancellor Gerhard Schroeder asked for the election after a bruising defeat in a regional poll in May. 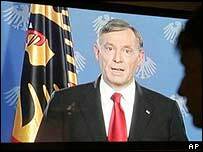 The court must decide whether German President Horst Koehler was right to dissolve parliament in response. He acted following a confidence vote deliberately lost by Mr Schroeder in order to trigger an election. The complaints were brought by two rebel deputies in Mr Schroeder's coalition government. Correspondents say the court is unlikely to uphold the complaints, paving the way for the September election.